Tracking the lost years - where do baby sea turtles grow? The clownfish, Marlin, encounters a turtle father as he searches for his lost son, Nemo, in Disney’s box-office smash hit “Finding Nemo”. As they ride the East Australian Current together towards Sydney, they compare parenting strategies. The Australian surf bum turtle, named Crush, tells Marlin, “Oh, it’s awesome, Jellyman. The little dudes are just eggs, we leave ‘em on a beach to hatch, and then, coo-coo-cachoo, they find their way back to the big ol’ blue.” Watch here! 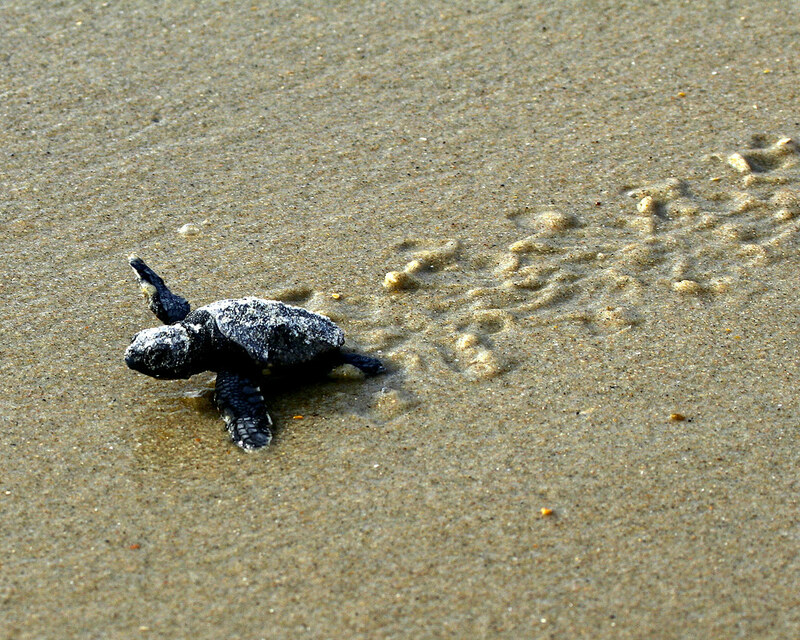 Crush, the turtle, is highlighting the post-hatchling and early oceanic juvenile stages exhibited by many sea turtle species, also known as the “lost years”. 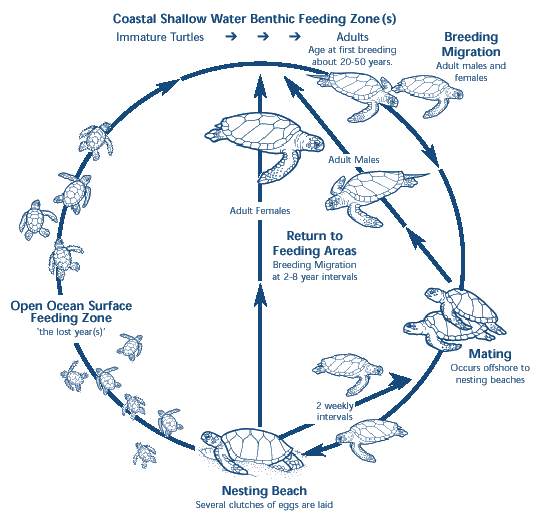 Until recently scientists had little understanding of where and for how long these juveniles were “out to sea” prior to shifting towards near shore coastal waters, hence the term “lost years.” The typical life cycle of sea turtles starts with hatchling emergence, where baby sea turtles begin a perilous mad dash to the water’s edge. Then a 24-48 hour swimming frenzy ensues, and until they disperse via oceanic currents out to the open ocean. 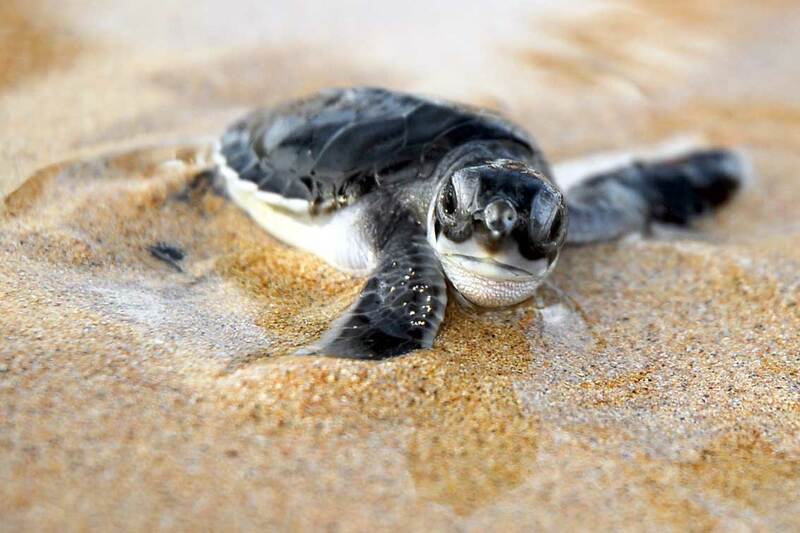 Scientists had hypothesized that these small juvenile sea turtles remain juvenile sea turtles stay in waters with comfortable temperatures and few predators for years. But it was nearly impossible to confirm this idea other than with vague oceanic models or the occasional sighting of a juvenile turtle in this kind of habitat. Considering sea turtles take decades to mature, there is a high consequence if individuals within a population die prior to reproducing. They must be protected across long periods of time before they even have the chance to reproduce. Researchers have been trying to solve the lost year’s conundrum to help direct conservation efforts for these endangered and threatened species, especially in regards to commercial fisheries that catch sea turtles by accident and human caused disasters like The Gulf of Mexico BP oil spill in 2010. In 2014, Katherine Mansfield, at University of Central Florida in Orlando, and her colleagues did something novel. Until recently, satellite transmitters have been used with adult turtles and other larger animals; however, these transmitters were the size of a baby sea turtle, making them too large to use to track the lost years. As technology improved, the size of transmitters became smaller and bulky batteries were replaced with smaller substitutes powered by the sun. Finally, transmitters capable of tracking baby sea turtles across long periods of time! Not so fast. Classic approaches of attaching the transmitters onto the juveniles with adhesive continually failed, only providing a few weeks of data before the transmitter fell off. Turtles during this early phase are rapidly increasing in size while shedding their outer hardened shells, which forcibly removes the transmitters. Collaborator Jeanette Wyneken, with the help of her nail salon technician at “Not Just Nails” in Florida, realized because turtle shells are keratin, the same material as our nails, they could use acrylic nail fill to attach the transmitters securely for months rather than weeks. 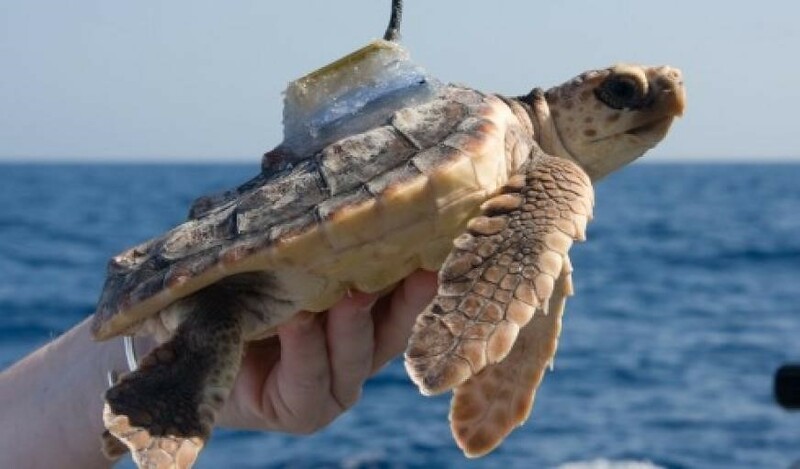 Using this method, they were finally able to track the movements of baby loggerhead turtles (Caretta caretta) off Florida for the first time. So what did the little guys do? The baby loggerheads, as predicted, remained away from coastal waters, traveled quickly within the oceanic currents, and opted for ocean habitats that had less predators and optimal temperatures. As scientists begin to utilize technological advances like these satellite transmitters across the globe to analyze life history stages of sea turtle species with greater accuracy, we are coming closer and closer to uncovering the lost years or the “coo-coo-cachoo” part of Crush the turtle’s explanation. Enjoy Katherine Mansfield’s explanation at Science Friday. Mansfield KL, Wyneken J, Porter WP, Luo J. 2014 “First satellite tracks of neonate sea turtles redefine the ‘lost years’ oceanic niche.” Proc. R. Soc. B 281: 20133039. That’s Life [Science]- your grad student generated source of insights into the life of everything from molecules to mammoths!